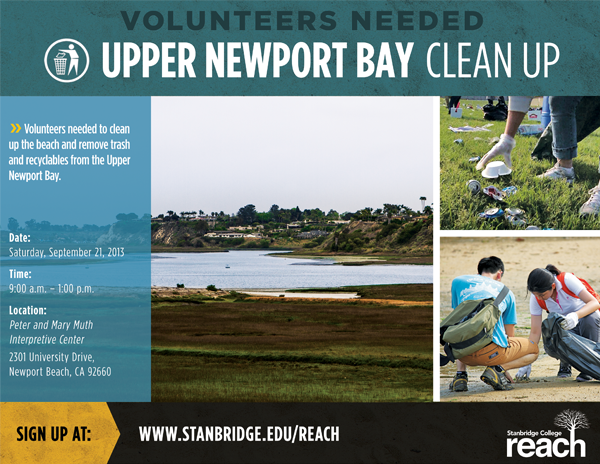 Stanbridge College REACH – Beyond the Classroom™ invites you to be a part of the annual California Coastal Cleanup Day with OC Parks at the Upper Newport Bay on September 21st, 2013. Litter and garbage are not just unsightly and upsetting for us; they pose a huge threat to wildlife. In order to prevent endangerment of our local flora and fauna, the California Coastal commission organized the removal of almost 770,000 pounds of trash and recyclables from California’s coastlines, bays, and wetlands in 2012. Join them this year to help keep your local Upper Newport Bay habitat beautiful. Volunteers are needed to help OC Parks and California Coastal Commission clean up the Upper Newport Bay by removing trash from the park and trails! Every piece of trash picked up can save our wildlife and make our environment a healthier and more beautiful place for all of us. No experience is necessary. Free recycled arts, crafts, and games will be happening during this event and food will be available for purchase. Don’t forget to bring a refillable water bottle, as OC parks will provide water for volunteers. This is a great opportunity to help keep this beautiful part of Orange County thriving!